Ring in the New Year with Sangria from Beso del Sol! While everyone else is sipping champagne, try something a little more exotic this New Years Eve! Beso Del Sol has a huge variety of great sangria’s that are absolutely delicious that your guests will be asking for more! 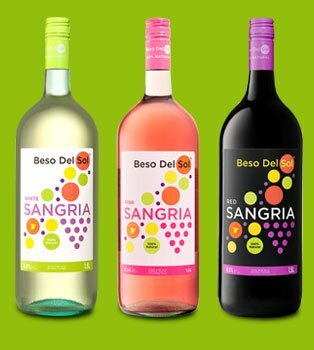 Imported from Spain, Beso Del Sol offers bottled sangria in three flavors, white, red and their new rose! They’re all natural, vegan, gluten-free, low sugar and fully authentic for only $5 a bottle! The price is great and the drink is even better. Available nationwide at your local grocers or liquor stores, Beso Del Sol not only produces delicious sangria, but help the environment, too, with their eco-friendly packaging – and make sure you try the TetraPaks (an adult version of a juice box) for easy sipping. Make sure you get your bottle (or bottles) today! For more information, check out their site. The Tastemaker is gonna make me the best Superbowl Bartender! Next Article NYE’s Gonna Be Crazy Over Here….